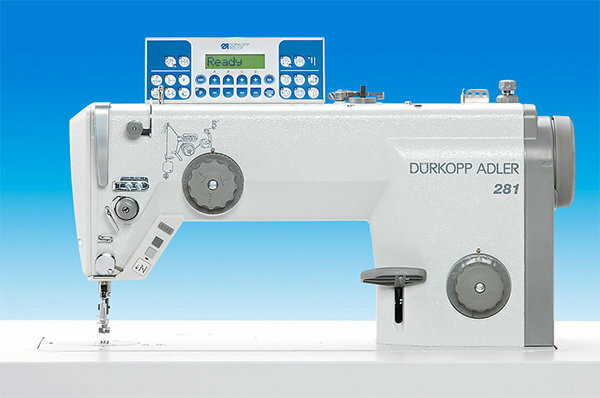 With an energy-saving and maintenance-free direct sewing drive integrated in the machine head the new generation of high speed sewing machines 281 sets new standards. The “Semi-Dry-Head” (with minimum lubrication of the needle bar and hook lubrication) avoids stains on the workpieces and guarantees quiet running and durability. The Premium design laid out according to ergonomic aspects with handily placed function keys, as e.g. the push button for manual backtacking, improves the handling in case of difficult sewing operations. The handwheel for adjusting the sewing foot pressure allows a quick and reproducible adaptation to various materials.